The Playhouse Theatre was the rather unlikely location for a day of cookery demonstrations by TV chefs this week. In such a large theatre, could an audience do the chefs justice? After rather cringing at the Tiggerish personality of Olly the “wine guy” from Saturday kitchen (did he have to do the same Mexican wave ‘thing’ at each demonstration? ), we settled in for an entertaining evening. I’m often frustrated by not being able to see what the chef is preparing – here this was overcome by a roving camera woman taking close-ups. These were alternated with fix camera shots. What a great idea, so simple and really effective. I am not really sure why the words Ainsley Harriott invoke a forceful response – I guess he is rather like Marmite, either you love it or you don’t. I’ve been a fan since trying to find an interesting cookery book for a beginner chef. She found that his recipes were easy to follow, tasty and effective. We were entertained with charming stories about Ainsley’s family – one of his aunties would smuggle mangoes into the country in her underwear in the sixties – and plenty of useful cookery tips. The recipes were colourful and vibrant (and tasted pretty good too). And the sight of Ainsley limboing across the stage? Well, that won’t be forgotten soon. His philosophy – learn to cook so you can enjoy eating with friends – who can argue with that? So were we entertained? Yes, and we learnt a few things too. 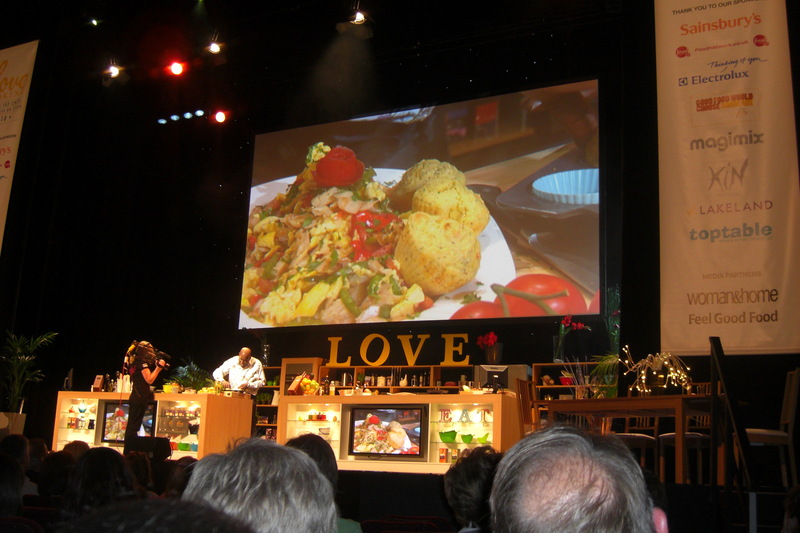 Caroline and I sneaked up on the stage to taste this cooking – delicious. 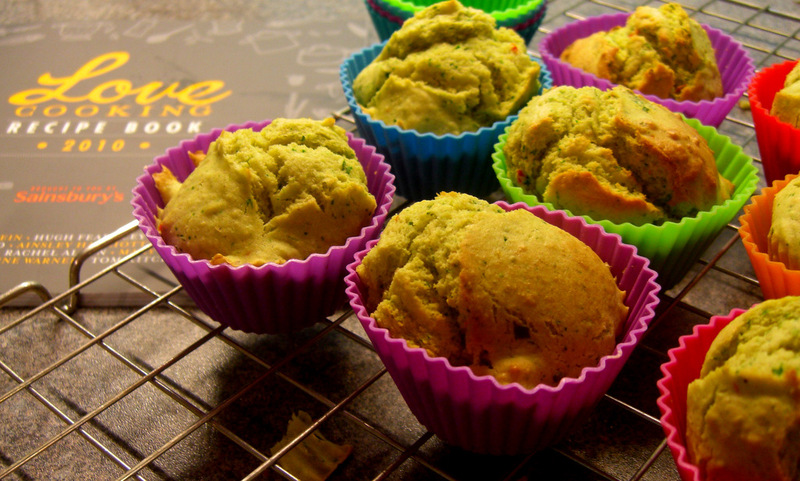 I just had to have a go at the cornbread muffins. I’ll certainly make them again. These are best eaten warm. They’re really easy to freeze and reheat. Paper or silicon muffin cases and tin. 2. Sift the flour, sugar, salt and baking powder into a bowl, then tip in the pepper and cornmeal. Stir to combine. 3. Make a well in the centre of the dry ingredients and quickly stir in the eggs, buttermilk (or milk mixture) and butter and mix until smooth. Fold in chilli and herbs until just combined. Spoon the mixture into the paper or silicon cases. 4. Cook for about 20 minutes until golden brown and a skewer comes out clean. (EF I found you need less time with a fan oven). Last updated by Bread Baker Danielle at October 19, 2010 .